Many GOP lawmakers would prefer cuts to entitlement programs rather than already-strapped agency operating budgets — and that's fine with party conservatives. WASHINGTON: President Donald Trump's plan to impose sharp cuts to foreign aid and domestic programs is a non-starter in the Republican-led Congress — and that's according to top GOP lawmakers. Senate Majority Leader Mitch McConnell, R-Ky., who once headed the panel responsible for the foreign assistance budget, told reporters that Trump's cuts to foreign aid probably couldn't pass muster on Capitol Hill. "The diplomatic portion of the federal budget is very important and you get results a lot cheaper frequently than you do on the defense side," McConnell told reporters. "So speaking for myself, I'm not in favor of reducing the (foreign aid) account to that extent." Trump's draft budget plan would add $54 billion to the Pentagon's projected budget, financed by taking an equal amount from domestic agencies and departments. Diplomacy and foreign aid would face a 37 percent cut that would be felt across the State Department and the U.S. Agency for International Development. Trump said in his Tuesday night joint address to Congress that his budget "calls for one of the largest increases in national defense spending in American history .... (and) will also increase funding for our veterans." Trump's budget was panned by the Senate's top Democrat, Chuck Schumer of New York. "The same time he's talking about medical research he's going to slash it," Schumer said on Wednesday. "Education. He talked about the great issue of education. Same thing. His budget is going to slash education to smithereens." 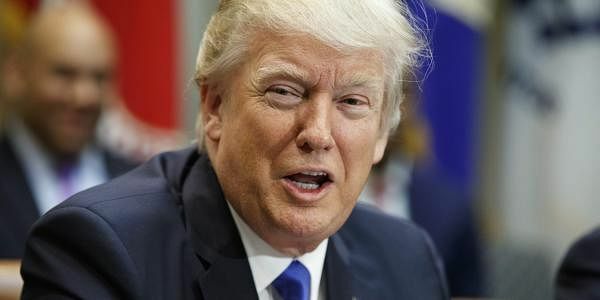 The initial reaction among Republicans signaled that Trump faces a fight with his party over the $1 trillion-plus portion of the federal budget that is passed each year by Congress. That discretionary part of the budget has been squeezed over the past few years, while Republicans controlling Congress have largely ignored the ever-growing tide of automatic-pilot spending on benefit programs like food stamps, student loans, and Medicare. The proposed cut to the State Department's diplomatic corps and the foreign aid budget are particularly striking, and likely to include security contractors at diplomatic missions abroad after the GOP criticized Democrats for security at the U.S. facilities in Benghazi, Libya, where four Americans died in a 2012 attack. "What the president wants is to move spending from, say, overseas back in this country," said Trump's budget director, former tea party Rep. Mick Mulvaney, R-S.C., on "Good Morning America" on ABC. "That's why you'll see fairly significant reductions in his proposals regarding foreign aid." Such a cut fits into Trump's "America first" worldview, but is alarming to lawmakers who see diplomacy and foreign aid as a small but crucial component of the federal budget, just more than 1 percent. Republican Sen. Marco Rubio of Florida, a primary rival of Trump, delivered an impassioned speech on the Senate floor in defense of foreign aid. Rubio argued that spending on foreign aid is critical to the U.S. economy and national security. "I promise you it's going to be a lot harder to recruit someone to anti-American and anti-American terrorism if the United States of America was the reason why they are even alive today," said the senator, a member of the Foreign Relations Committee. Other Trump targets include the Environmental Protection Agency, the IRS, and many grant programs for state and local government. Public housing vouchers for the poor are targeted as well, much to the consternation of the pragmatic-minded lawmakers on the House and Senate Appropriations committees, whose programs were significantly curbed by a hard-fought 2011 budget and debt agreement. "We've reduced our discretionary spending over the last seven or eight years an incredible amount," said House Appropriations Committee Chairman Rodney Frelinghuysen, R-N.J. "Maybe some people don't like those agencies, but it's been pretty difficult for them to meet their mandate." Top congressional priorities include aid to disadvantaged schools, Pell Grants for low-income college students, medical research, Amtrak subsidies, and water and sewer projects. "There are important priorities within the domestic side, on the discretionary side of domestic spending," added Sen. Jerry Moran, R-Kan.
McConnell noted that it requires Democratic votes in the Senate to pass appropriations bills. That works to the advantage of more pragmatic Republicans. "We can no longer expand federal spending without finding savings somewhere," said Rep. Andy Harris, R-Md. "And so, the people who want to protect nondefense discretionary, they're going to have to realize at some point we may have to look at the entitlement programs." Trump has said he wants to leave Social Security and Medicare alone, though Mulvaney says other entitlement programs are likely to be addressed in Trump's full budget submission in May.